All dog owners know that canines make the greatest companions! They love having endless magical adventures with us and this is no different in the winter months! At The Insurance Emporium, we realise that cold weather might mean having to take greater precautions to keep your dog healthy this winter. That’s why we’ve come up with a list of ways in which you can keep your dog in paw-fect condition! Your dog’s paws can be just as sensitive as human skin, so they could be damaged by snow and ice. Keeping their feet well-groomed might be a good idea to avoid a build-up of ice between their little toes! You can also buy booties which could help protect their paws, but make sure they fit properly! Not all pups are blessed with a thick fur coat! If your dog has short hair, or even no hair at all, getting them a jumper or coat could make their walks more comfortable. This might be an especially good idea for smaller breeds who lose heat more quickly. Plus you could be seen with the smartest doggy around! There’s been a lot of talk over the years about the danger to our canine friends when stuck in hot cars! However, it might be just as bad for your dog in winter. Cars left alone for a long time can become extremely cold – exposing our dogs to dangerous conditions. Nobody likes being left out in the cold! We all know how much dogs love food! If your pooch is spending a lot of time running around outside in the cold, they could be burning more calories than normal. 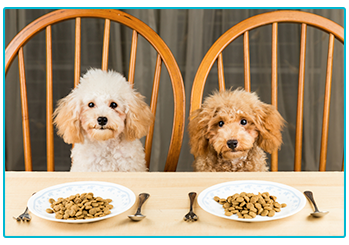 This might mean your canine needs a little extra food! It’s best to speak to your vet for advice, though, before changing your dog’s feeding habits to avoid getting it wrong. It can be a lot easier to lose sight of your doggy during the poor visibility associated with weather such as fog and snow. Before you know it they could be over the hills and far away! So it might be a good idea to check their collar and tag are secure and up-to-date! You could also check that their microchip has the correct information and contact details stored on it. It’s not just for humans! As with people, a dog’s skin can get drier during the winter months! You might think about washing them less, so they keep hold of their natural oils. If you find your canine companion is walking on cracked foot pads you could rub coconut oil into them to add moisture. Even the most rugged dogs can do with a little pampering from time to time! We want the best for our pets all year round and hopefully these tips will help keep your canines comfortable and safe during the colder months! 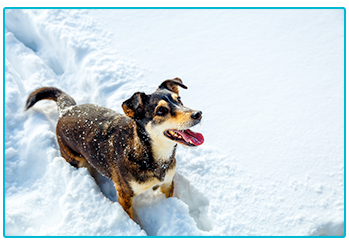 Regardless of the season, it could be a good idea to take out insurance for your precious pups. 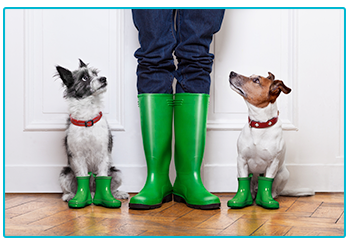 At The Insurance Emporium, we offer up to 30% discount* on Dog Insurance. Head to The Insurance Emporium today to find out more! * The 30% discount is available on lunar and calendar monthly policies and policies where the premium is paid annually. It is made up of 20% Introductory Discount plus 10% Multi-pet Discount (if appropriate). The 20% Introductory Discount is available for the first 12 premium payments on lunar and calendar monthly policies or one premium payment on annual policies.